Free parking complimentary Wi-Fi indoor and outdoor pools and a pet-friendly policy at the non-smoking Sheraton Augusta Hotel put smiles on the faces of our guests headed to the Garden City. The five-floor hotel has 152 rooms offering Sheraton Sweet Sleeper beds with plushtop mattresses and down-filled duvets large desks with ergonomic chairs coffee makers iPod docking stations 37-inch flat-panel HDTVs and free Wi-Fi. Bathrooms include designer toiletries. 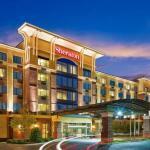 Sheraton Augusta Hotel has a 24-hour business center 24-hour front desk guest laundry facilities 24-hour fitness center lounge heated indoor pool and hot tub an outdoor pool and patio. A full-service restaurant serves breakfast lunch and dinner. Room service is available for further convenience. For those who drove town parking is provided free of charge. Located off I-20 Sheraton Augusta Hotel is two miles from Augusta National Golf Club home of the Masters Tournament. Augusta Mall Bell Auditorium and James Brown Arena are five miles away. The hotel is 15 miles from Augusta Regional Airport.